Virginia is for lovers, and this weekend it belongs to horseplayers. 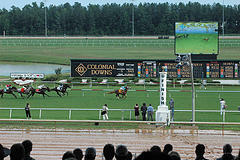 At Colonial Downs, there will be some turf racing that will be some of the best in the country. So enjoy this little oval, and take in the greensward during the hot weekend that lies ahead. J.J Castellano is up for Ham Smith, and they can get it done. Exits a victory at this track, and Rosemary Homeister is off for this rider change. They went 5 panels on this day, and now gets an extra 1/2 furlong to play with. I see this gal driving heavy down the lane, and she looks to be something special. A nice work on July 3 shows me that she is rested and ready. Sometimes the high % trainers don’t need a blowout that rings the bell. They use the work to tighten the screws. His trainer is winning at 23%. J.J Castellano is up for Todd Pletcher, and they are winning 28% as a team. Dropping to a nice level from G-3 action at Monmouth, and now in for a stakes for 50k. Now, that is nothing to sneeze at, and this could be a money maker. The price is square, and the rider knows his way around every turf course in the country. 2/2 at Colonial, and that weighs in for a good hard look on this day. Dominguez up for Graham Motion, and he gets it done whever he ships in. Dropping from the G-2 Sands Point to the G-3 levels. Exited off the win, and is 1/1 at Colonial. Motion is winning at 29%, and that is enough to get you half of the way there. He liked his chances last night on the radio show, and I think his runner will take some heat at the windows. The last race showed the country that he relishes the weeds. 1/1 at Colonial, and Kent Desormeux knows what he has here. This can be his real coming out party, and I would look for him to shock the world with a bull move down the lane and storm home to victory. I have liked him ever since he won his maiden in a G-3 event at Gulfstream. They tried conventional races, but I feel he has the making of a real nice grass horse. Bet early and often…..
Good luck, and stay cool this weekend!